Rock Hippo Productions announced yesterday that Brawl Busters, the popular free-to-play multiplayer action-combat game, has launched part one of its latest update: Lethal Weapons. The most recent update brings new weapons, weapon perks, and so much more. Blast away the competition with all new weapons and weapon perks. Boxers can throw powerful punches and bounce opponents with Devil’s Skull metal gloves that are sure to get the job done. 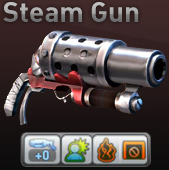 For Firefighters, a new Steam Gun acts as a dynamic flamethrower able to take down the most feared enemy. Additionally, starting today, weapons will have special perks that give players certain benefits like extra damage and defense. New advanced stats per class are now available in the game for the most curious players! You will also be able to check out what all your characters are wearing while in the Match Room. Players can also take part in the European Cup 2012 GameDay Challenge and predict the winners of every soccer match. By supporting their favourite national teams and predicting winners, players can earn valuable Buster Points! This entry was posted on Friday, June 15th, 2012 at 9:28 am and is filed under National News, New Releases, Shooters, Teen. You can follow any responses to this entry through the RSS 2.0 feed. You can leave a response, or trackback from your own site.